Since our founding 60 years ago, Scholarship America has had a singular focus on supporting the dreams and aspirations of bright minds, no matter what their circumstances and obstacles might be. From our beginnings as a community scholarship drive in Fall River, Massachusetts in 1958, we have grown to become the nation’s largest private scholarship provider. 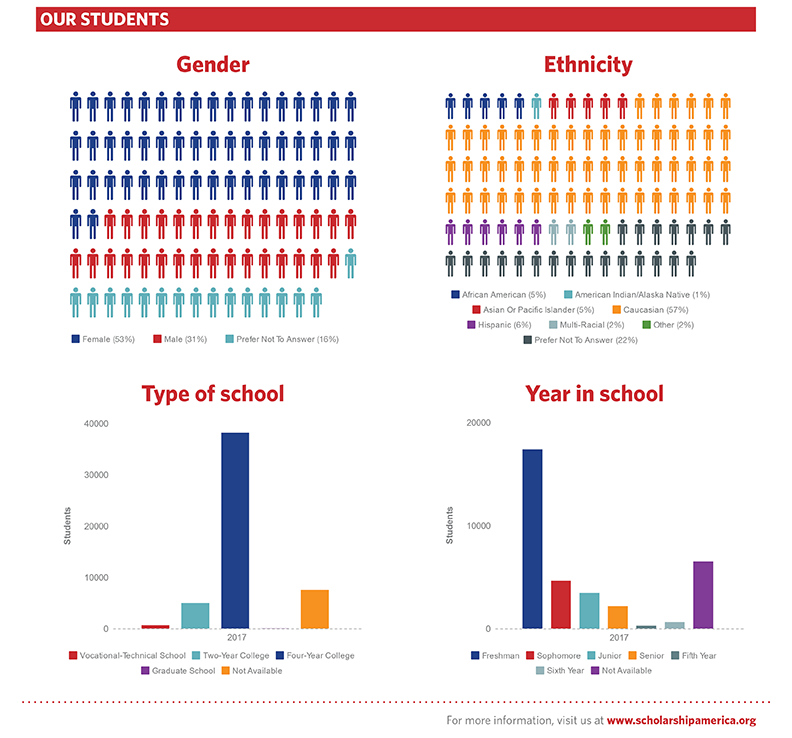 We have distributed more than $4 billion to more than 2.4 million students. We are driven to ensure that any student pursuing higher education receives the support they need. We make students’ dreams possible. More than $190 million of those scholarships came through our nearly 1,400 partner programs—whose sponsors range from individuals to 100 companies in the Fortune 500. Our community-based, volunteer-driven Dollars for Scholars chapters provided more than $20 million to 18,635 students across the country, and our Families of Freedom Scholarship Fund continued supporting dependents of those killed or disabled in the 9/11 attacks—as it will continue to do through 2030. 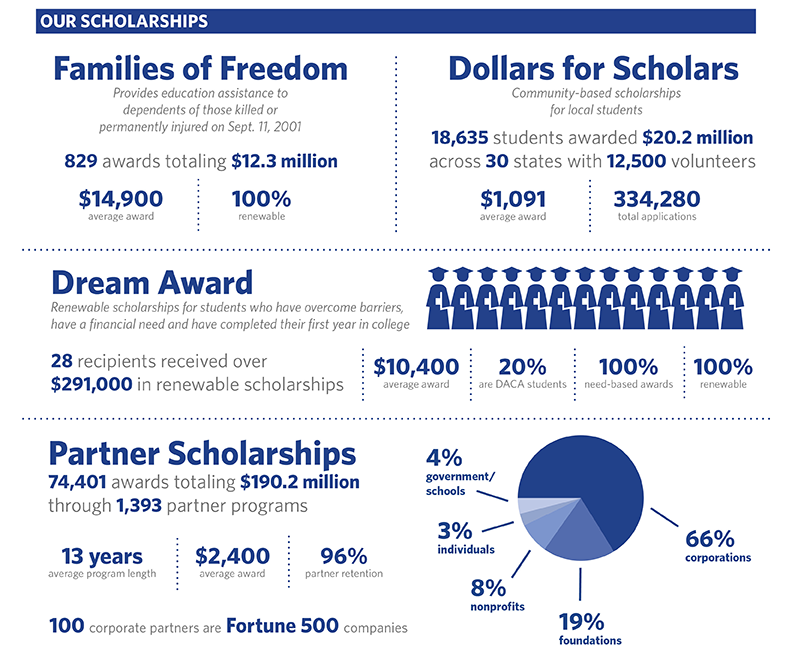 Finally, Scholarship America’s flagship Dream Award provided nearly $300,000 in renewable scholarships to 28 remarkable students. Visit our blog to meet the 2018 class of Dream Award recipients—and join us at Dreams to Success to meet the 2019 class! As a nonprofit scholarship provider, we have always relied on the power of people. From our early days of door-to-door community fundraising to the $30,000 raised on #GivingTuesday this November, our supporters have given their all for students. We extend special thanks to our Board of Trustees and Honor Roll Trustees for providing 100% support over the past three years. There’s no substitute for a dedicated, expert team—and we are immensely proud of ours. Scholarship America was named a Top 150 Workplace during the summer of 2018, and our team’s loyalty and depth of knowledge make our products the best they can be. Our students and partners get 1:1 personal service; our client solutions team brings a combined 155 years of financial and educational experience to the table. Scholarship America’s technology and security are just as dedicated. In 2018, we underwent a full GDPR compliance review. Our systems are monitored 24/7, we have never had a loss of data, and our students’ information is not sold, for any reason. Ever. Scholarships are just one piece of the puzzle. When it comes to college success, students need financial, social and cultural support. That’s why our Dreamkeepers program helps those facing critical financial emergencies, from car repairs to overdue rent to child care. And that’s why our Collegiate Partners agree to make the most of Scholarship America financial aid—these 313 institutions promise not to displace or reduce student aid because of private scholarships, and many even match Scholarship America awards. Today, there is no such thing as a “typical” college student. They are more diverse in age, gender, income, ethnic background and personal circumstances than ever before. At Scholarship America, even after 60 years, we recognize the need to constantly grow, change and serve student populations where they need it most. With your help, we’ll spend the next 60 years changing millions more lives.